Jason English grew up in his dad’s personal injury law practice in Tarrant County, graduated from Texas A&M before getting his law degree from St. Mary’s University School of Law. Initially he worked in his father’s firm on personal injury, wills and probate, as well as, family law cases. Soon thereafter he took his father’s advice and worked for the District Attorney’s Office to obtain trial expertise. 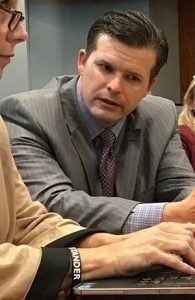 Jason English was an Assistant District Attorney with the Travis County District Attorney’s Office in Austin, Texas from 2007-2017. The Travis County District Attorney’s Office has jurisdiction over felony offenses. Mr. English was a prosecutor in Texas 2002-2017, working at the Cameron County Criminal District Attorney’s Office in Brownsville, TX and at the Hays County District Attorney’s Office in San Marcos, Texas. Upon joining Travis County District Attorney’s Office in 2007, Mr. English was assigned to various courts before being assigned to the Special Prosecution Division’s Public Integrity Unit handling white collar crimes committed against state agencies or crimes committed by state officials. Mr. English had been the Strategic Prosecution Unit’s Community Prosecutor working as the liaison between the DA’s Office, Austin Police Department, and the community. During this time he was assigned to address special issues or top offenders affecting the community, as well as, advising the Austin Police Department regarding felony cases and sting operations. The work included various initiatives such as an enhanced prosecution initiative, as well as, implementing a Drug Market Initiative following the High Point, North Carolina Model. Prior to leaving prosecution, he had been over various diversion programs for the Travis County District Attorney’s Office, specifically handling the Mental Health Docket and the Veterans Court. After 15 great years as a prosecutor, he has returned full circle to handling personal injury, will and probate cases, as well as, practicing criminal defense. He counts his father’s sage advice for getting years of courtroom experience that translates well for his clients. Call Jason today to schedule an appointment to speak with him.